Do you think you or someone you know has dyslexia? You may be wondering how to get a correct diagnosis – either through an online dyslexia test or a psychologist. This blog will give you an insight into why Online Dyslexia Tests are a cost-effective and sensible option for not only diagnosis, but also as a skills update and source of recommendations for exam concessions and employer support. 1. Online dyslexia tests are credible. They have had to become more rigorous in terms of their research and validity. For example, the QuickScreen Online Dyslexia Test was created from our recent research data, as well as our experience from the last 20 years. QuickScreen has been created to assist those people (17+). It can be accessed by individuals or via organisations that utilise a management portal for multiple candidates. It can be completed in less than 1 hour (or in stages). The test provides results in the categories of none, borderline, mild, moderate and strong indications of dyslexia. It also identifies results for a wide range of other skills. Each result is presented in a written format and accompanied by a bar chart using a traffic light system for scoring. Full guidance for future action is provided. Regarding research, most recently in 2015/2016, we conducted a study into our QuickScreen test. This included work with Universities and members of the public via the British Dyslexia Association website. Over 2000 people had taken the test at that time. This research proved that where a candidate gets a mild, moderate or strong dyslexia indication, they are very likely to have been correctly identified with dyslexia. See our full research here. We are also the team behind the first computer based dyslexia assessment programme – so rest-assured we are credible. When first created in 1997, Pico’s computer-based dyslexia assessment was quite an innovative concept (The Studyscan Suite). This was the first adult online test to be produced and somewhat ahead of its time. Not many people had a personal computer; let alone access to mobile devices and social media. It was no wonder that the idea of online testing was treated with a degree of scepticism. Twenty years on, the situation is largely reversed. Working on-line is the norm. It is the pen and paper test that could be considered somewhat incomplete in its scope when testing relevant skills for current day requirements. 2. Online dyslexia tests provide diagnosis and helpful ongoing skills assessments at various points in an individuals life. Research shows that once a person has been diagnosed as dyslexic they are unlikely to cease being dyslexic throughout their lives. But they can do assessments to get an up-to-date view of their skills. Therefore, if someone has a positive diagnosis, then why would an up-to-date online dyslexia test not be valid and useful? The test is not always there to prove dyslexia, it also provides a skills update for the purposes of study requirements, exam concessions and to help employers offer relevant support. 3. 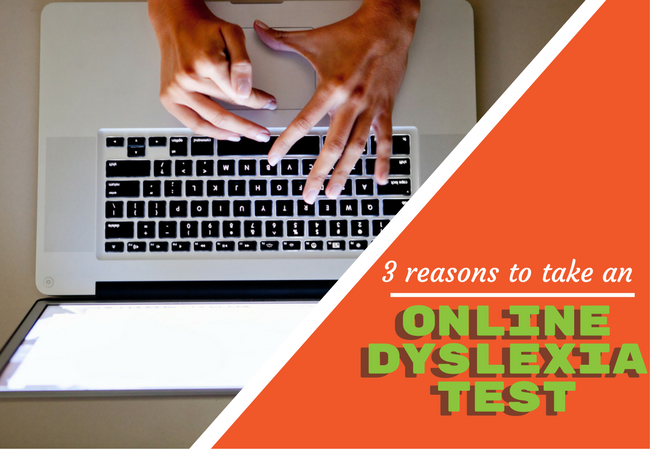 Online dyslexia tests cost less than a full dyslexia assessment with a Psychologist. If someone has not been assessed officially, or possibly cannot afford to pay for an assessment with a psychologist, there should be other options for them. Online tests are very affordable. And if someone completes one or several reputable online tests, that show indications of dyslexia, these should be seen as valid results. In Summer 2017 a tweet from an adult dyslexic (@samthedyslexic), who acts as a dyslexic representative for the public sector, asked ‘Is it fair to have to pay to be dyslexic? Many adults cannot afford the £500+ required to get a full assessment and therefore remain undiagnosed and ‘suffer in silence’. In November 2017, Lord Addington, president of the British Dyslexia Association raised the same issue. This was reported by the BBC. Lord Addington said it was unfair dyslexic students had to pay up to £600 to have their condition reassessed to claim the disabled students’ allowance at university. Education Minister Lord Agnew agreed the system should be reviewed. All of our points are up for discussion and comment. Have you had good experiences with online dyslexia tests? Find out more about our online dyslexia test here or take the test now.